This time I would like to introduce you to a friend of mine from university. 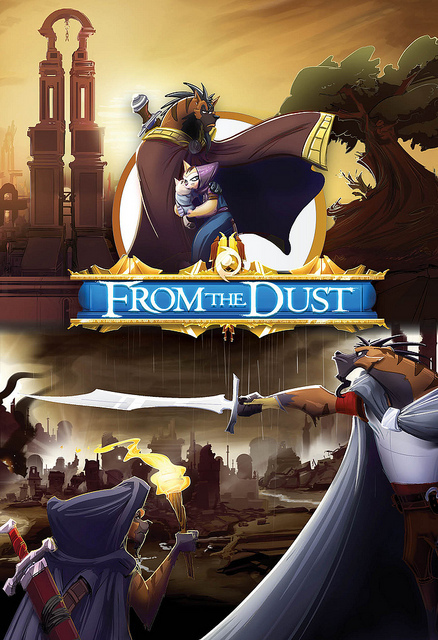 His name is Michael Mercer and he is the creator of From the Dust. 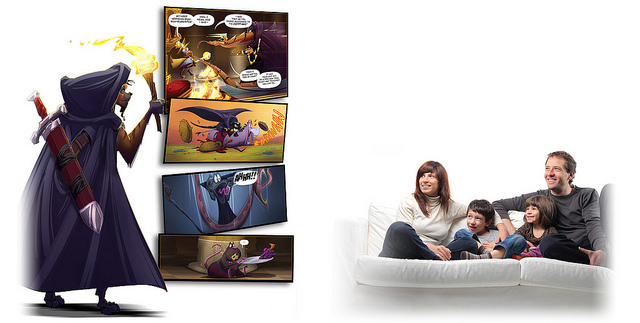 If you are interested in Mormonism, family and wholesome entertainment and comics you should keep reading. Michael Mercer grew up in Atlanta, Georgia y served a mission for The Church of Jesus Christ of Latter-day Saints in the Philippine Islands. He graduated from Brigham Young University with a B.F.A. 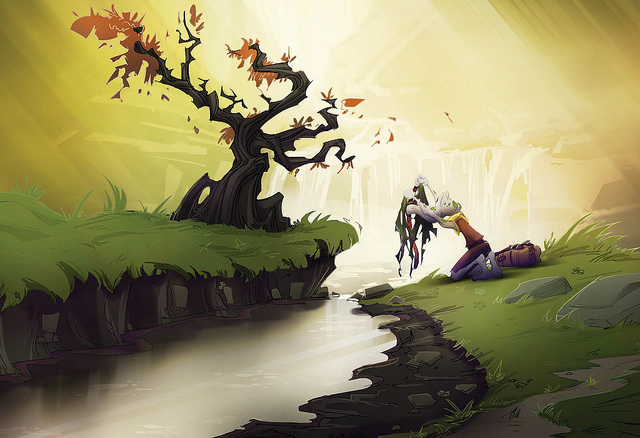 in animation and since then he works in the entertainment industry as a concept artist, animator, and motion graphics artist. I sent Michael a list of questions to interview him about From the Dust and here are his answers. 1. 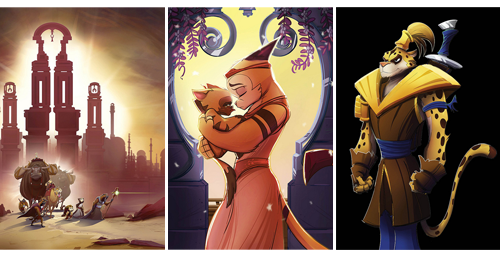 For those who don’t know yet, can you tell us what From the Dust comic is and who it is for? From the Dust is a comic book series like Spider-Man or Batman that tells the story of the destruction of Jerusalem in 587 BC according to the Old Testament and the Book of Mormon. All images in this post are courtesy of Michael Mercer and they have copyrights. 2. Where can we get From the Dust not just in English, but in Spanish and other languages? The English version is available as a PDF and a physical book. 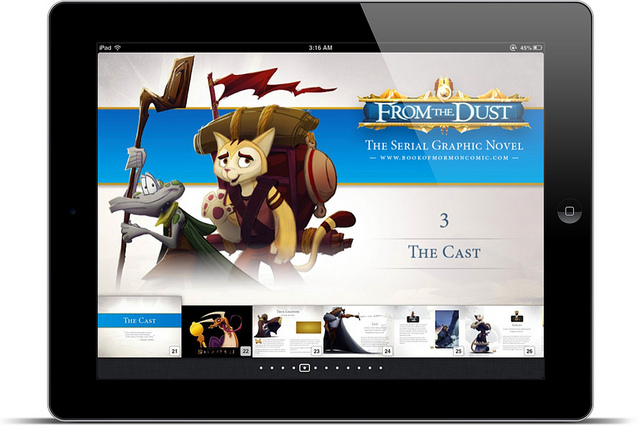 It is also available as a Multi-Touch(1) book for iPad on the iBookstore. The Spanish version is available as a PDF on a pay-as-you-can basis. You can get it for free if you share it on Facebook. I do not yet know the future formats of From the Dust, but it will assuredly be digital, and will be in a format most accessible to the most people. PDF or web are the most likely candidates. 4. What has the general reception been? The reception has been fantastic! People love From the Dust, especially youth. Anyone under the age of 24 is usually excited to see a high-quality telling of the scriptures, and if not excited, it “peaks their interest.” Our Facebook fan page has a division of 55% guys and 45% girls and 90% of them are under 24 years old. As far as I am aware, we have the largest Facebook fan page for any LDS-exclusive family media product. 5. The first issue introduces scripture characters, land characteristics, and historical facts, but if that were not enough, From the Dust also introduces Hebrew and drawing lessons! And you said you are the only person behind all this. Besides making From the Dust, you are also a self-publish artist and, I’m assuming, you also have several other things going on, so what has been the most challenging part of making From the Dust? Balancing a primary income stream while trying to produce the series has been very challenging. 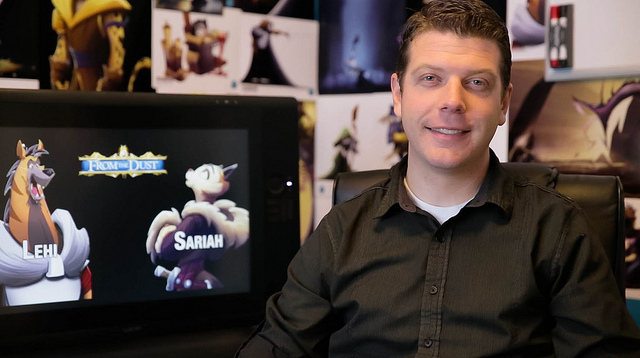 In fact, I have had to step aside from the project temporarily to build a new business, www.MotionCraft.tv which creates animated videos for businesses, which will hopefully help fund From the Dust. 6. 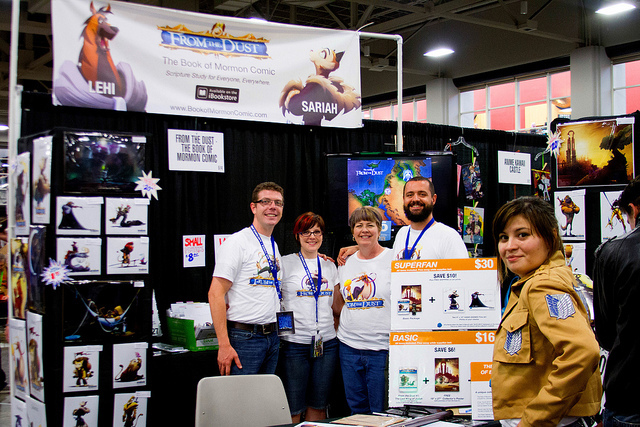 The LDS Church has published the illustrated Book of Mormon Stories. And there is also The Animated Book of Mormon series of videos. How is From the Dust different from these other stories? There’s a number of ways to answer this question, but at the end of the day, the simplest answer is From the Dust is an entertainment product, not a word-for-word visualization of the scriptures. 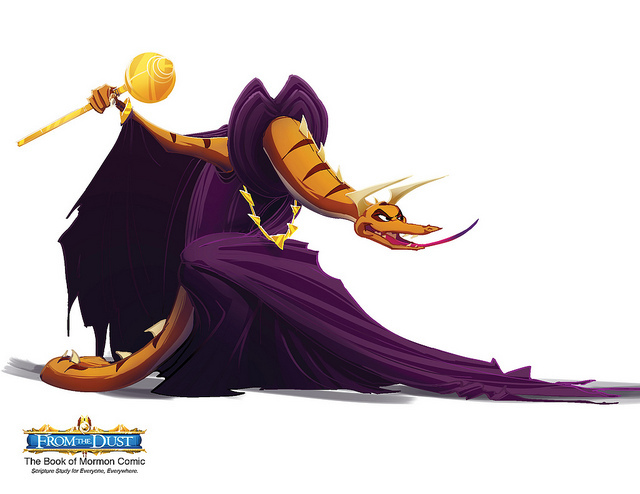 Imagine if Walt Disney got a hold of the scriptures – that’s From the Dust. From the Dust is of sufficient quality that your kids and teenagers will actually read it and love it. I’m a big believer in the power of quality entertainment. It also happens to be highly accurate to the scriptures so you can feel safe that it will inspire and enable them to read the real scriptures. 7. In a previous conversation we had, you expressed a desire to make From the Dust available to many LDS families outside of the US and English language market, even in countries where reading comics may be a luxury. Could you share more on that, including the motivation behind it? I believe every Latter-day Saint family no matter their economic circumstances has a right to enjoy high quality entertainment that aids them in their efforts to build a strong spiritual foundation of faith and knowledge in the home. I served a mission in the Philippines and I know how hard quality media is to legitimately obtain in some parts of the world. From the Dust will be the first LDS media available simultaneously to a worldwide LDS market. 8. Have you ever found yourself at a really low point where you just see things not going the way you would like to? And if you did, how did you manage to keep going and what advice would you give to others who face similar issues? I’ve been there, but so have many others as well. When I am at my lowest, I always turn to the scriptures and to the Lord. 9. What’s the general process of making From the Dust? And what software, hardware, or tools do you use? I tackle From the Dust as if it were a high quality television series. I use word processors to write, Photoshop to draw and design, and InDesign to create the final product. 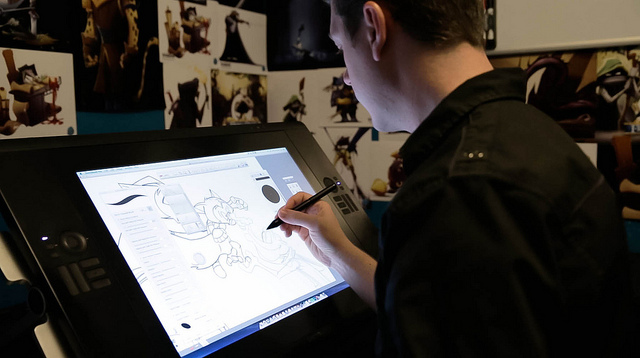 Everything is created digitally from start to finish. 10. Has making From the Dust affected your attitude, knowledge and/or perception of the Book of Mormon in any way? Yes. 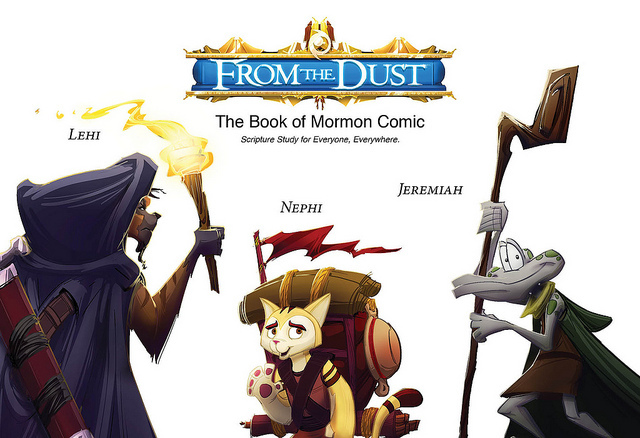 Before I started From the Dust I had a very narrow and superficial understanding of who the Book of Mormon characters really were and what their journey was really like, despite the fact that I was a return missionary and had read the Book of Mormon many times. It wasn’t until I studied Jeremiah in the Old Testament and the destruction of Jerusalem that I felt my eyes were opened. I hope to lead every reader of From the Dust on that same journey of enlightenment. As I have researched I have come to appreciate the epic nature of the origin of the Book of Mormon, and the fact that the stories contained therein are truly some of this world’s greatest true-life narratives. 11. How do you think or what would you expect From the Dust is going to affect your readers and why? 2. Empower individuals so that when they read the real scriptures (especially the Old Testament) they have a solid understanding of who is who, what is what, and where is where. 3. Deepen a reader’s understanding and respect for the characters of the scriptures and the historical events that shaped them. 12. 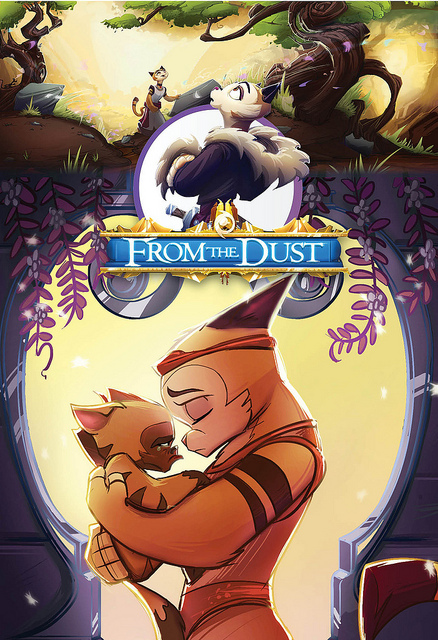 What is the most common question you get about From the Dust comic? The most common question is: “Why animals?” The short answer: kids love animals. From the Dust is made for the whole family, not just for teenagers. 13. I quote from your website FAQ: “Animals appeal to children and help them understand the ancient world more easily. Plus, animals are fun! They clearly communicate to readers that From the Dust is a work of fiction and not reality.” By reading this a few questions come up to me. First, focusing on the animals. How do you assign an animal to each of the scripture characters? How do you deal with the cultural differences across countries? Take a dog, for example, in the West, it is considered the man’s best friend, a loyal and intelligent pet, while in other cultures, specifically where Islam is the major religion, dogs are considered filthy and dangerous. Cows are sacred in India, turtles are linked to body odor in Thailand, pigs are a symbol of good luck in China, etc. How do you deal with that? This is an interesting question. In fact, to expound on question 11 previously, I chose animals, specifically because they cross cultures in a way that human beings can’t. While I agree with you that animals have a general stigma in various cultures, based on my research these are minor influences compared to the visual impact of human ethnicity and culture. What if made Lehi a middle-eastern Bedouin, as some LDS scholars have surmised him to be historically? By doing so it actually decreases a white American child’s ability to connect with the character – not only because of looks, but also because of culture. If I attempted to be highly accurate visually, it would be easy to assume I would be highly accurate culturally and historically. This type of thought process looks good on paper, but in reality it is a packaged deal where if you are highly accurate with one aspect of your story, you are expected to be accurate with all aspects – and when you’re not you lose respect. However, that same accuracy tends to inhibit viewers – particularly youth – from connecting with the story, because you’re telling a foreign story of a foreign people in a foreign culture. I won’t go into all the reasons but this type of high fidelity in my opinion is less effective for this era in history. The best solution is to move as far away from fidelity as possible while staying “true” to the story. Hence, the animals. Even a beginning reader understands that Lehi was not, in fact, a hyena (as he is in From the Dust) when they read about him in the Book of Mormon. 14. You have answered the following in the comic itself and your website, but I ask for this audience, comics are strongly associated with words such as entertainment, drawings, and in many cases, fiction while the scriptures are strongly linked to words such as sacred, text, and doctrine. Is From the Dust an effort to bring these things together or are you leaning towards one side more than another? From the Dust is a work of fiction. If you are looking for doctrine, the Church provides excellent resources for that. I describe From the Dust as an “entertainment tool” which families can use to accomplish the 3 purposes listed my answer to question #13. I feel the primary problem with the scriptures is that they are less accessible to many members, especially converts, who don’t have the many years of Sunday School, Seminary, and Institute, to build on. From the Dust is designed to help anyone of any age in any background build this gospel foundation quickly so that they can understand and enjoy the scriptures as a family right from day one. Imagine a convert mother trying to teach her 8-year-old son and 10-year-old daughter the stories of the scriptures when she’s only read the Book of Mormon once (and never read the Bible). This mother would struggle to remember names, places, and reasons for actions. Now imagine the same mother reading From the Dust with her children side by side with them and then reading the associated scriptures pertaining to the story. She is reading From the Dust for her children’s sake, but it is simultaneously giving her a foundation on which she can build her own knowledge base. This is but one example of how From the Dust is designed to be an entertainment tool that brings us closer together to the scriptures as families. 15. The media, Hollywood, popular art, and others, including comic books, can be immeasurably powerful in terms of creating and affecting collective and individual ideology, identity, perception, and much more. In the LDS culture we can point out several examples of artists and works that have played a major role in developing a traditional visualization or conceptualization of scripture characters. In other words, such works of art, in a way or another, have left an impression of how these biblical and Book of Mormon protagonists are now perceived in the mind of the LDS community. From the Dust offers a new visual commentary of the scriptures, and in particular, bringing a fresh perception and interpretation of scripture characters and settings. Do you have any thoughts on this? A “fresh perception and interpretation” might be a good thing. Am I trying to “rebrand” the scriptures? Not really. 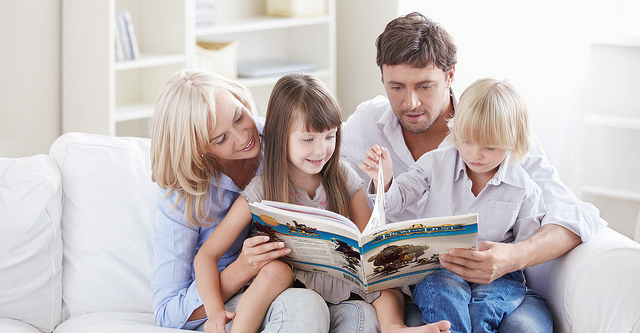 I’m just trying to get families to be able to read them together and enjoy them, which based on my research is a struggle for up to 80% of Latter-day Saint families. If I can help families to enjoy their nightly scripture study – rather than dread them – that, at the end of the day, is my ultimate goal. 16. What kind of attitude towards scripture characters and perception of Old Testament society’s mannerisms and behavior do you think From the Dust will leave in the mind of the reader? 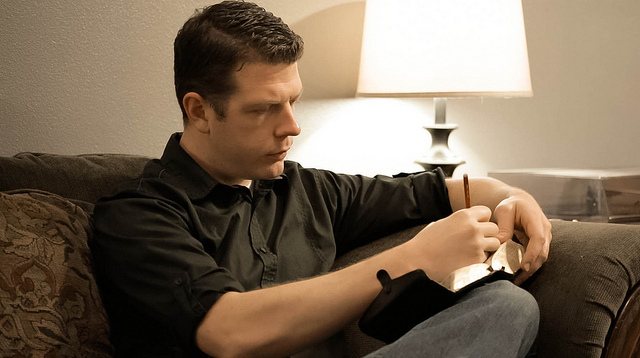 I am modernizing Old Testament behaviors and language to fit the modern viewer. Primarily I would like readers to see how similar we are to them, and how great the prophets of the scriptures really were, especially Jeremiah, Lehi, and Nephi. 17. In the first issue, on page 15, you talk about “relational accuracy” and give an example of it. Could you expound on it? Relational accuracy is a term I created to describe how From the Dust can be both “fictional” and “highly accurate”. Primarily, it means that rather than nitpicking details which are irrelevant, such as how tall or large Nephi was (which is impossible to determine), it prioritizes the relationship Nephi had to his father, to his brothers, and to the world around him. If you take this concept one step further, it means that when you learn the relationships of kings, countries, parties, and powers to one another in From the Dust, those same relationships will be found all over the real scriptures and will empower you to know what the relationship was between Egyptians and Judeans or Babylonians. This clarifies scriptures that would previously have been an enigma to you. Relational accuracy will teach you about the relationship between a Jeremiah and the priests, or Jeremiah and the royalty, or Jeremiah and the commoner, or even Jeremiah to other prophets. So don’t worry about the details, folks, because the details won’t always be perfect in From the Dust. But the relationships in From the Dust will be both enlightening and edifying and are often highly accurate to the information we have in scripture and other resources – not to mention common sense. 18. There is a quote by Andrew Smith that says: “Comic books, like all pop culture, reflect who we are instead of who we say we are. They’re a mirror, and even if we want to look away, we shouldn’t.” Would you agree? If not, why not? If you do, what parts of you as a person do you think may be the most reflected in From the Dust? Your personality? Faith? Perseverance? Drawing skills? What? I think that Andrew’s comment is fairly generalized, and I believe that there are lots of comics we should “look away” from. He brings up a good point which is that the American comic industry is not regulated for content as are other entertainment industries such as video games and movies. Thus, a comic could have essentially “R-rated” material and could be marketed to – and purchased by -young boys without parental consent. This is a serious concern and one which I feel every American parent should be made aware and should seek to change. 19. What are the chances that you go on a promotional tour, and especially in Mexico? I think it would be great visiting some cities, do a quick lecture/presentation followed by a Q&A session and signing of your comic. Unfortunately, I have run out of funds and have had to put From the Dust in hibernation for awhile. I do not know if the Lord will see fit to allow me to continue to create the project, but if so, yes, Mexico and other Spanish-speaking countries will be a huge market for my work. As for touring, it is more likely that if Mexico has any Comic Book or pop culture conventions, I would make an appearance at those periodically, just as I do in the United States. 20 Do you have some social media links you would like to share so people can connect with you? All our social media is through our Facebook, Twitter, and YouTube pages, with Facebook being our focus. As stated, you may find these pages in hibernation as well. The best way to stay in touch with us is to Like our Facebook page or Subscribe to our emails. 21. And before we finish, what makes Michael Mercer happy? 22. Is there anything you would like to add about From the Dust or anything else you want to say or share with those who are reading/listening this? Don’t assume there isn’t more to learn about your scriptures. There is always more to learn, and it will enrich your life as you do so. 1. 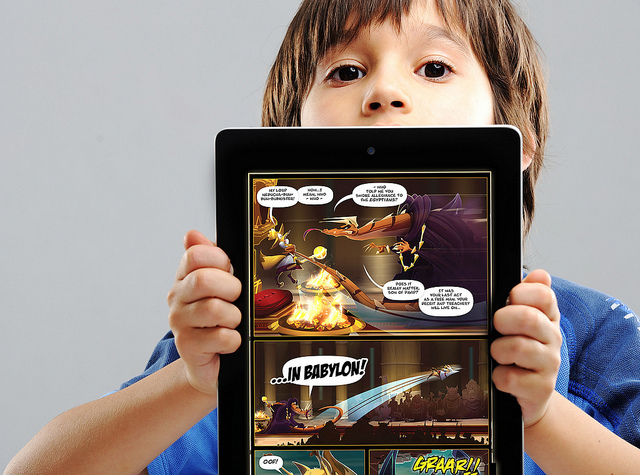 Multi-Touch technology books are interactive books that may have links, scrolling sliders, audio, video 3D objects and some other functions. All pictures and images are courtesy of Michael Mercer and they are all copyrighted.